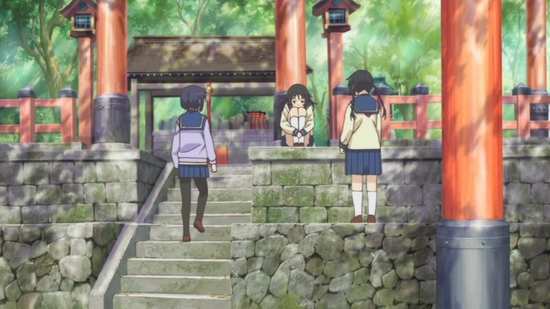 Inari Fushimi is late for school one day, and takes a short cut through the local shrine. On the way, she spots a fox cub in difficulty on a stream bank, and tries to help, falling in the stream for her trouble. 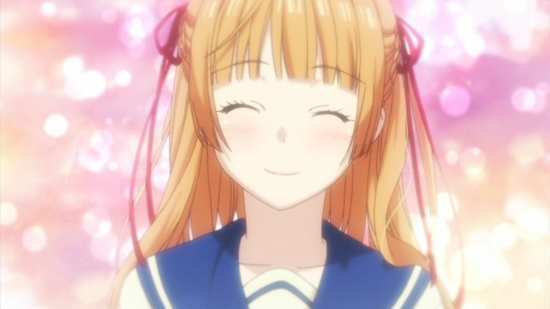 Her day gets a whole lot worse though, as she’s been nursing a crush on a boy at her school, Kouji Tanbabashi. The problem is that she’s a little ditzy and not a little clumsy. She thinks he’s sweet on another girl, Akemi Sumizome, and her one chance to talk to him during Phys Ed goes disastrously wrong when she accidentally pulls down his tracksuit! She does what she usually does in such situations, finds a spot in the shrine to be depressed. Only this time the goddess of the shrine appears to her, in gratitude for saving one of the sacred foxes. She offers to grant any wish, only Inari in desperation wishes she was Sumizome. The daftness of that idea quickly becomes apparent, but the problem is that a wish once granted cannot be un-granted. To make up for this, the goddess gives Inari a portion of her power, and now Inari can change shape, into any other person. 11 episodes of Inari Kon Kon are presented across 2 DVDs from Madman Entertainment. Alas the Inari Kon Kon Blu-ray is locked to Region A, but thankfully on this occasion, Madman Entertainment merely repurposed the Funimation DVDs for their Region 4 release. The 1.78:1 anamorphic NTSC transfer is progressively encoded, and clear and sharp throughout. 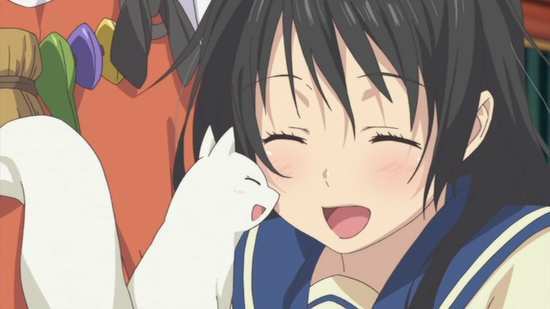 The animation is smooth, and the cheerful character designs come across well. It’s a romantic comedy, so expect appealing characters and a warm and comfortable colour scheme, Detail levels are good, and the world designs are accomplished with consistency, although this show’s view of the realm of the gods is a little mundane. You get a DD 2.0 Stereo Japanese track with translated English subtitles. The audio is fine for what is a gentle, slice-of-life, occasionally romantic comedy. Action never gets too strident in this show, demanding intricate sound design. The actors are suited well to their roles, while the dialogue is clear throughout. The music too suits the gentle paced comedy well. The subtitles are timed accurately and are free of typos. You get two discs in an Amaray case from Madman Entertainment, one held on a central hinged panel. There is some nice artwork on the inner sleeve, although it isn’t reversible. The discs boot to animated menus, with jacket pictures and each episode gets a few pages of translated credits after the end. Disc 2 holds all of the extras, and at first glance, you might think that the Pub Fox Theater would be the most interesting. This lasts 13:34, but in reality merely collects the next episode previews together, which are in the form of SD characters inconsequentially bantering in a bar. It’s not all that funny or interesting to be frank. You get about a minute of Commercial Collection, two minutes of Promotional Video, the textless credits, and the US trailer. Inari Kon Kon has one major problem, and it’s called Kamisama Kiss. 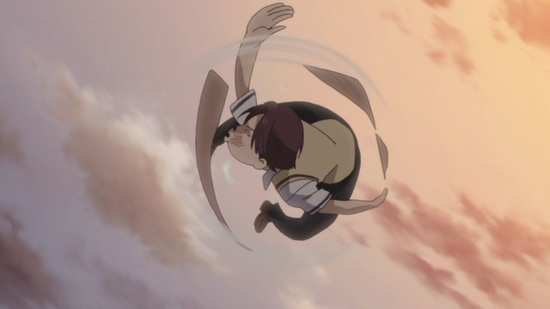 If you want an anime show about a school-girl gifted divine power and all the subsequent problems that arise, then Kamisama Kiss is the superior anime, in terms of characters, in terms of comedy, in terms of story, in terms of romance and especially in terms of world building. If that doesn’t suit your tastes, there is also Noragami to take in, which takes a different perspective on the premise, focusing more on the gods than the girl. 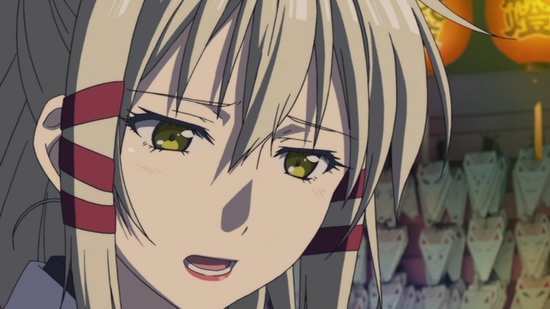 Inari Kon Kon just doesn’t have the pep, the narrative bite, or depth of concept to match up. However, just because there are better options out there, it doesn’t mean that Inari Kon Kon isn’t entertaining, fun to watch. It also has the benefit of being a complete story; there are no loose ends begging for a second season. 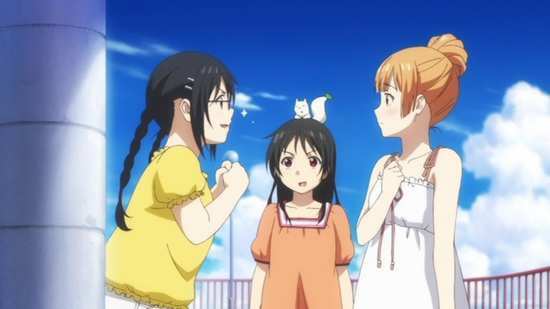 It’s a show with a slice of life vibe to it, but its strengths lie in the character studies. 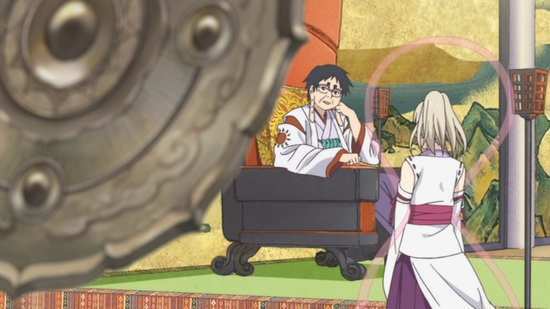 At the heart of the show are Inari Fushimi and Uka-no-Mitama-no-Kami. Inari is the school-girl whose act of kindness to a fox cub gets noticed by the goddess Uka, and it’s how she winds up with godly powers. Inari is shy and clumsy and lacks in self confidence, which makes expressing her feelings to her crush Tanbabashi nigh on impossible. 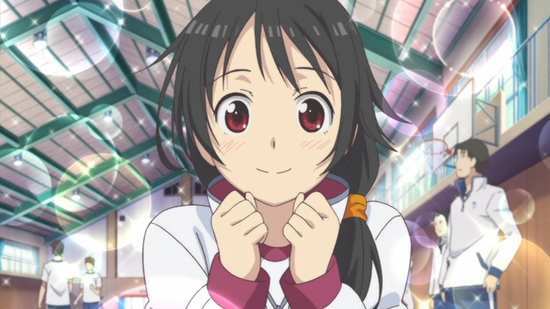 Uka’s powers allow her to change into any other person, and her first thought is that if she doesn’t have ‘self-confidence’ she can at least try ‘someone-else’ confidence, although confessing her love to Tanbabashi as another girl from school is no solution. Uka on the other hand is a shrine goddess who tends to shun her godly duties, preferring to lounge around the shrine playing video games. 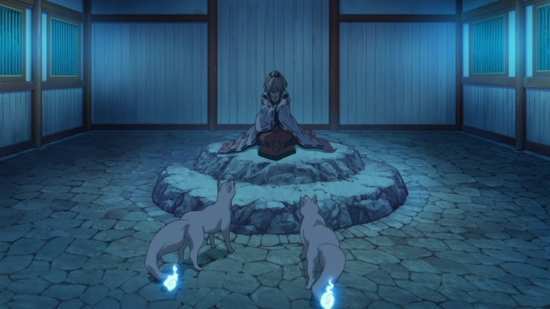 She has a fascination with humans, and quickly befriends Inari, the girl who has always worshipped at the shrine. She gives her the power to change shape when a hastily asked for wish predictably goes wrong. She keeps an eye on Inari thereafter, vicariously experiencing her life, sharing in her triumphs and successes, feeling the pain of her failures. But Inari having her power takes a toll that she’s not expecting, which naturally draws the censure of other gods, particularly Amaterasu who has to lay down the law to both Inari and Uka. The arc of the story follows the growth of both of these characters, Inari becoming more self-confident and outgoing, and Uka learning that it isn’t always wise for gods and humans to interact, that even with the best intentions, showing favouritism to people will cause problems. 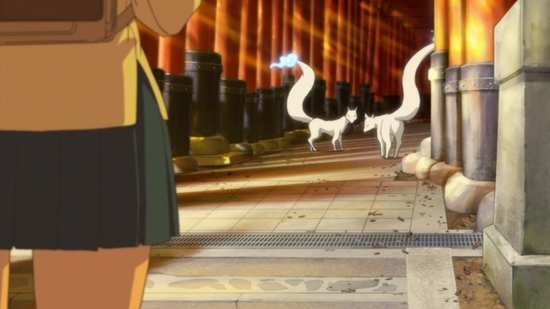 Inari Kon Kon plays out really as a slice-of-life light comedy show, although for Inari, she has to balance two lives, that of a school-girl, and that of what is really a temporary goddess, although while she has the powers, and she has a familiar in that fox cub named Kon, she doesn’t have the same responsibilities. Navigating school, friends, and a first crush is hard enough, without being tempted to change shape for a quick solution to her problems. 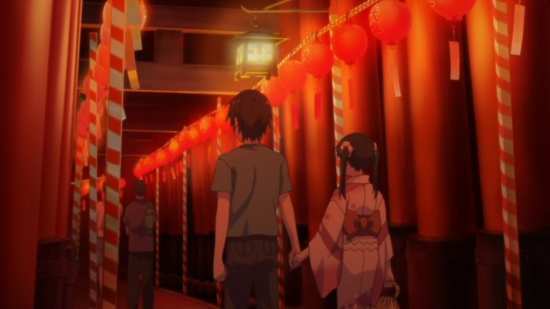 Things get even more complicated when it turns out that Inari’s chunibyo brother Touka can see Uka, is protective of his sister, and he doesn’t trust the goddess. You won’t be surprised to see that it plays out like many a school-set anime, with a summer festival, a beach trip, a school culture festival and so on and so forth. 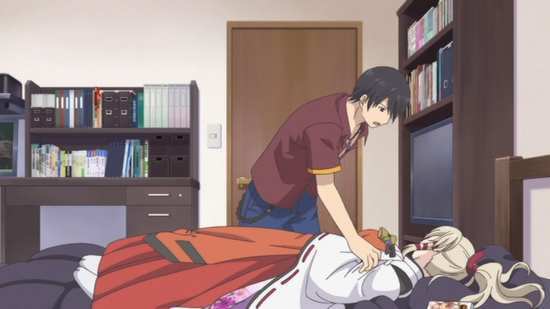 Inari Kon Kon has a nice story, likeable characters, offers up an appealing blend of light comedy and light drama, and it’s wrapped up with decent production values when it comes to the animation. It’s an entertaining and fulfilling show which commits the sins of not being groundbreaking, original, or standing out in any way. 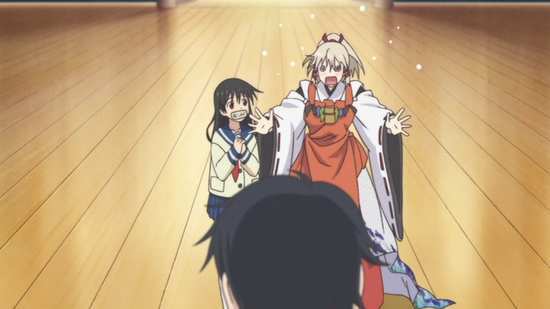 I don’t know if that’s damning with faint praise, or lauding with tepid criticism, but Inari Kon Kon is a lot more fun to watch than it is to write about.